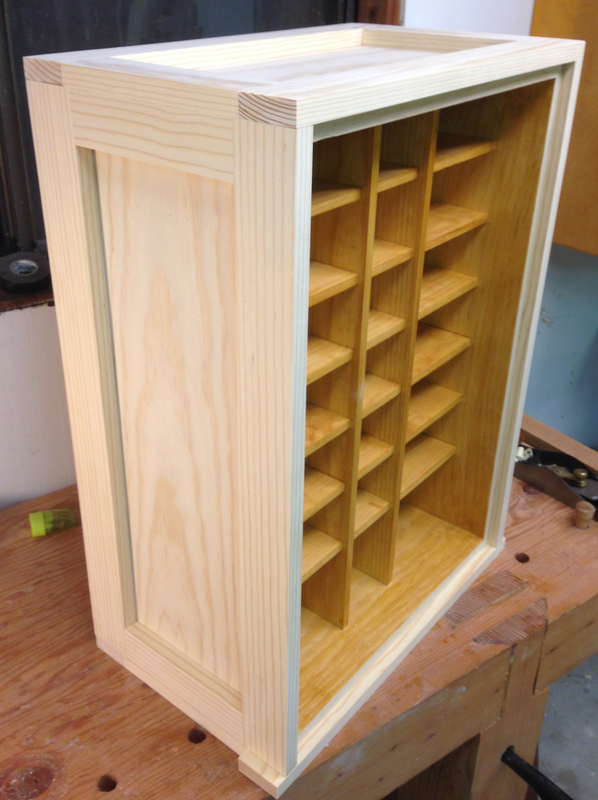 Moving right along, I finished up the case yesterday, leaving just the door and drawers to do. I added a cleat to hang the hang the cabinet that is recessed in the crate trim — I hope I don’t regret that. It means that the cabinet needs to hang exactly over two studs, but it also won’t show when the cabinet is hung. I really hate drywall walls. In my dream shop I’d have plywood or shiplap walls. 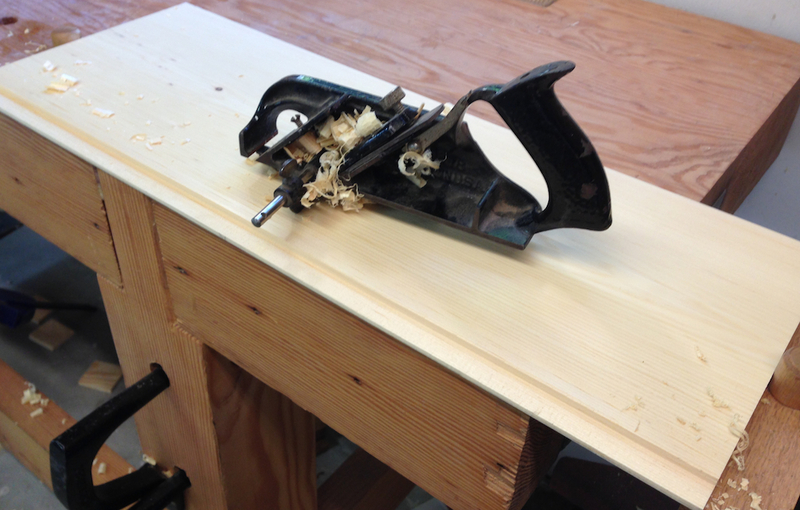 I started with the back, I machined some stock to 3/8″ thick and cut a 3/16″ rabbet in two edges to make the back. I padded on a quick coat of shellac, skipping out the outer edge of the inside face so I could glue it. I glued just the vertical edge of the two panels, and nailed them all around. 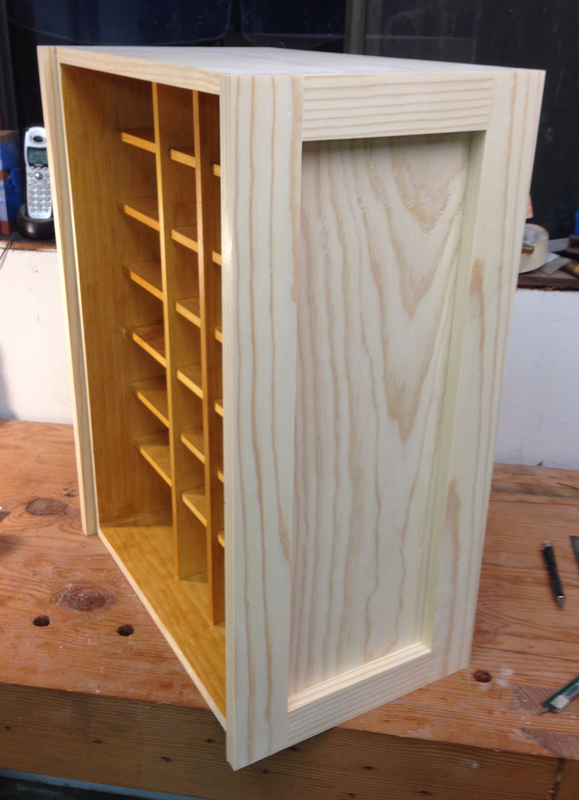 Pre-finish the inside, except for the outer vertical edge, which gets glued. Next I ripped some strips to make the “crate” banding. I don’t really follow the reasoning on the width. 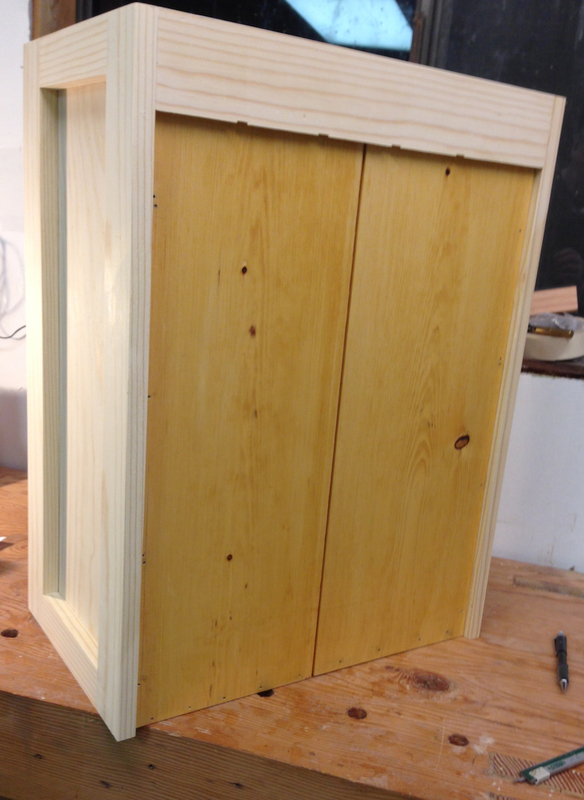 On the sides it’s 2 1/4″ stiles and 1 3/4″ rails, while the top and bottom have 2″ rails and stiles. 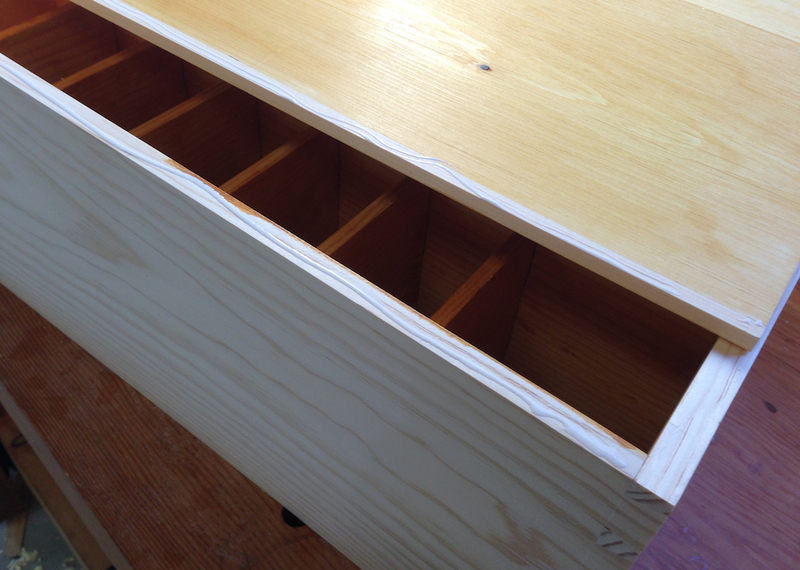 And the bottom, front rail extends out wider than the cabinet. But I’m just dutifully following instructions, when people ask I will just tell them it’s “an exact reproduction of Roy’s”. I’m already worrying about what to do for the beer girl poster on the inside of the door, I saw one on ebay for $800 which is out of my budget for this project. You might think this is a cheap build, you might also be surprised. Compared to a lot of projects I suppose that’s true. Here is the tally as I see it: Probably five ten-foot 1 x12’s at $15 each, so about $75 for lumber. I’ve used three boards so far, not counting the waste from re-making the dividers, to get to this stage. 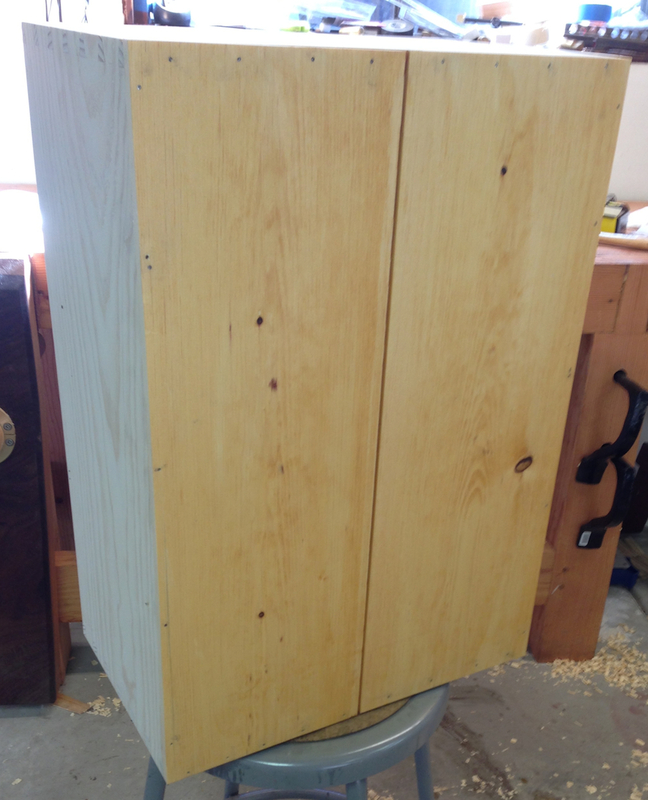 I am sure I’ll need at least two more to make the door and all of the drawers – more if I don’t re-saw to get the thin stock for the drawers. Add in a pair of hinges ($20.40), $25 worth of knobs and $58 for the 14 bin pulls and you’re quickly over $175. I’ll probably look for some cheaper hardware for this, it’s not a piece of fine furniture, just a useful shop accessory. Anyway, the crate trimmings were like falling off a log. Cut to length, glue and nail on. I used my pin nailer on these as I didn’t have any cut nails (or even wire nails) the right length. The glue will provide the strength, and they don’t have a lot to do structurally other than hold the door. Excellent work Joe. Here is a link to a t shirt iron on of Roy’s Poster for $25 which can probably transfer to canvas. Looks great. About the beer girl why not copy It off the net and print it on decal stock or sticky stock or just make one. Heck I don’t know…but it looks good an I think you did a top shelf job. That’s my current thinking, to print it in color at Kinko’s (my home printer is only 8.5″ x 11″ and this needs to be a bit bigger I think). Maybe 12″ x 18″ or so. Or maybe I’ll print it in sections and tape it together. 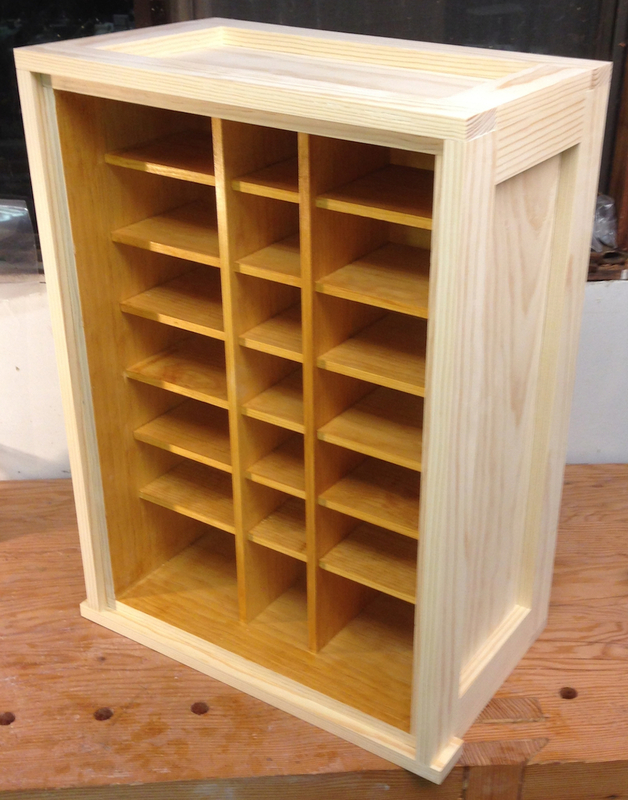 I wish I could get 1x12x10 clear pine boards here in RI for $15. Having the clear stock bumps up the wow factor for this a bit. I picked through a big stack for the “clearest”, then cut around the knots. I’d happily pay a bit more more for “select” boards, but my local home center doesn’t carry them. Some of the boards – the ones I passed on – were more knot than not. I went to “Southern Lumber” recently as they carry a broad selection of wood, including prime, clear pine. It was about $6/bf and really, really lousy stock. No knots, but twisted, cupped and bowed. It was just sad, I left without buying anything.